Celestial Pursuits: Cards vs. Craziness!!! Black Friday is aptly named. That is to say that if you are brave enough to fight the crowds then you will end up in a black mood. I generally volunteer to watch the sleeping kids while my sisters and their husbands go shopping. This year however, all the kids were covered and so I stayed home and tried to finish up a few cards and tags for some gifts I am putting together. Boy was I glad I did when "A" called to tell me that while she had been at Walmart the paramedics were brought in three times--one man broke his shoulder, another woman broke her wrist, and a lady fainted. No sale is worth that to me. Then I logged on to check the weather and on ksl.com it said that a worker in an Arkansas Walmart died after the crowds broke down the doors and knocked him down in their pursuit of a bargain. So sad! Well, on to the cards and tags. I used today's card sketch on splitcoast stampers for the layout design. 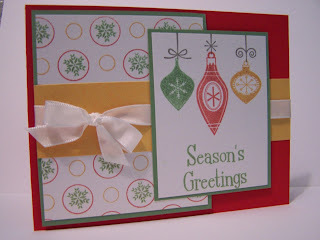 I made my own patterned paper with a polka dot set I have, filling in some of the circles with snowflakes. The tags are part of the gifts I have put together for my neighbors. Every year I try to think of a gift that is not food related and that can be useful. 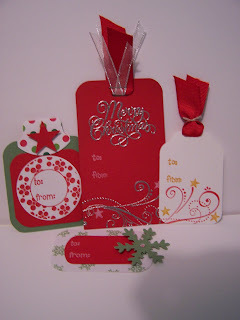 These tags along with some wrapping paper and a cute poem are what I am handing out this year. If I get time to take a few more pictures I will share the other tags I have come up with. In all I have about 10 designs. By the way--HAPPY BIRTHDAY "J" and "B"